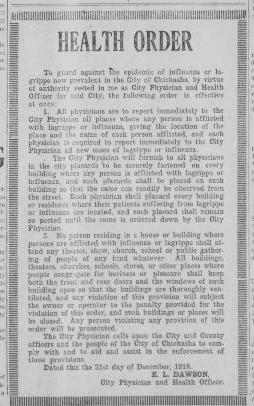 Chickasha City, OK issues a health order: all physicians must immediately report any case of influenza; the city will furnish doctors placards to post of houses they quarantine; no person living in a placarded building can attend church, school or any public events. Source: “Health Order,” The Chickasha Daily Express, Chickasha, Indian Territory, Oklahoma, December 24, 1918. Page 1, Column 4.